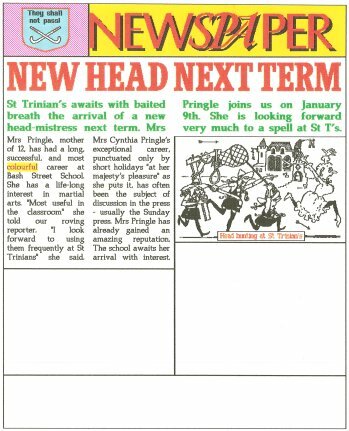 "Children will find that using Newspaper is a bit like running a small daily paper, though hopefully less hectic! To make the package as intuitive as possible, the various tasks are presented to the user as though they were jobs in the paper's offices." Here is where you design the overall layout of your page. Use mouse or cursor keys to 'drag out' areas into which either text or pictures are to be fitted. 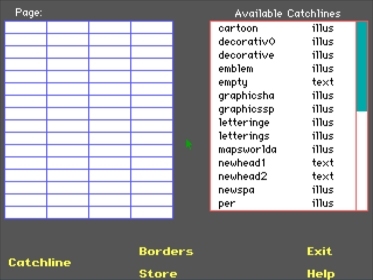 Then allocate 'catchlines' to each area to say what goes where. Write your articles here using a powerful inbuilt WYSIWYG word processor. A wide choice of typefaces, sizes and styles are available to each article. And you can put parts of your text in colour, or type on coloured backgrounds with ease. Draw your pictures here, using a comprehensive drawing package. Paste in ready made artwork from the library supplied. Print out your page here - in black and white or (on suitable printers) in colour. You can even produce colour separations from which process colour printing can be done. The layout here is an overall view, the printed output is more precise! 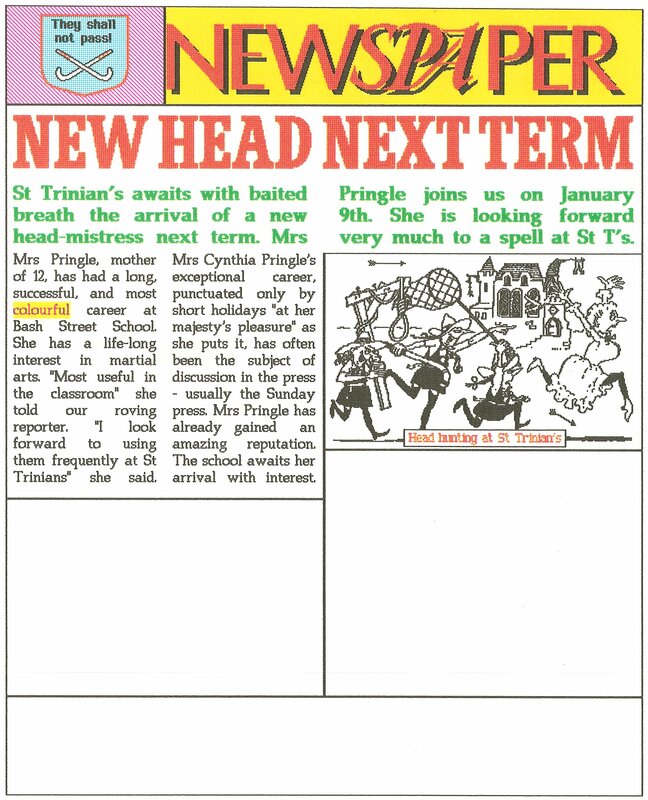 NewSPAper is designed to produce pages as in a real newspaper. 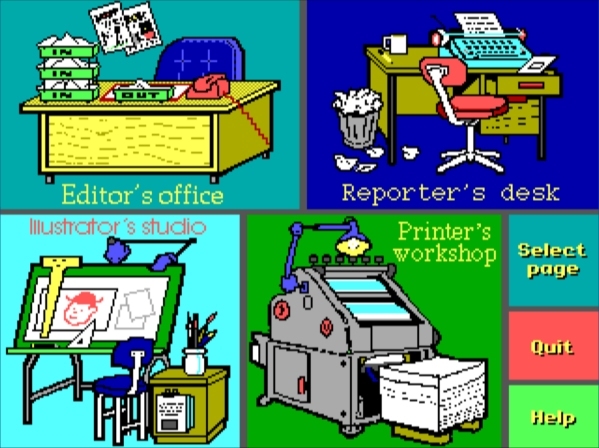 It can also be used as a simple desktop publishing program. There are four areas to work from, The Editor plans the layout of the page which can incorporate graphics, headings and text. 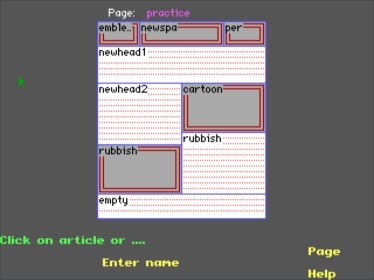 The Reporter uses a simple wordprocessor to write articles. The Illustrator prepares the pictures. Pictures cab be created using a full range of draw and paint facilities or by importing graphics from the library. The library can also contain items of text. 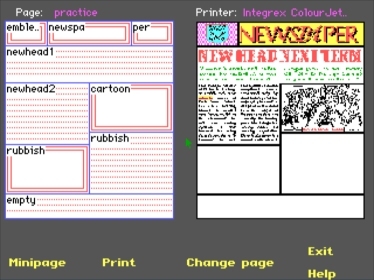 In the Printers Workshop the user previews the page, check layout details and prints. The program can be used for collaborative group work where students undertake the different tasks of planning, writing and layout for an individual piece of work. There is on-screen help at all stages. The program comes with a notebook which contains understandable, detailed notes and tips on how to use the program. There is also a reference manual for more advanced users. Although not a professional desktop publishing program, NewSPAper can produce reasonable results once the basic principles of the program are understood.